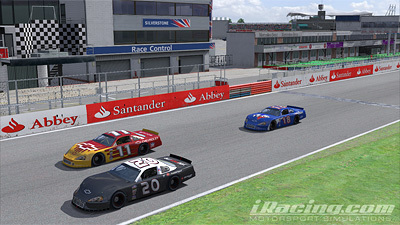 Another memorable and enjoyable race in the Oval Road Odyssey (‘ORO’) this week when the league visited Silverstone. It was also the first time I raced at the National circuit which is a very short layout. The entire field was closely matched and the race would turn out to be extremely competitive throughout the grid. I didn’t really have a great qualifying, netting tenth on the grid where I could have earned 7th on a good lap, and the race itself took a turn for the worse when I lost four positions in the first few turns, thanks to some close battling with rivals on the track. Over the course of the race I had some good battles, and some very narrows escapes. In fact I don’t think I’ve ever had a race with so many close escapes without getting caught up in at least one race ending impact!